Anderson United Methodist Church began as a mission in 1914 under the leadership of local ministers from the Central and Pratt Methodist Episcopal Churches. One of the ministers, the late Rev. R.L. Pickens, then pastor of Central, helped organize the Cloverleaf Methodist Episcopal Mission. During the 1920s, the first group of members met at the home of William Harper on Woodrow Wilson Avenue where they worshiped until a specific location was secured. 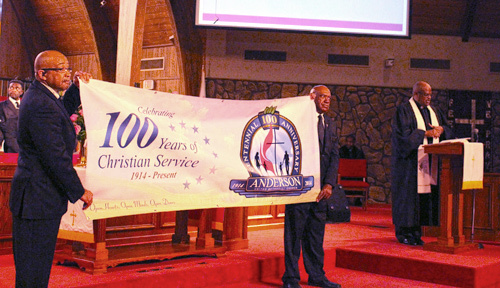 Pastor May and congregation recently celebrated AUMC’s 100th year in the community. By 1928, a temporary house of worship for the mission had been obtained—an old abandoned store on Whitfield Mill Road (now Martin Luther King Dr.). In 1936, a lot on Spring Street was purchased, and the first church building was constructed. It was named for the Rev. R. L. Anderson, the first conference appointed minister. Rev. Anderson died in 1930. The Rev. I. R. Kersh, Sr., was the pastor at the time of Anderson Chapel, as it was known then, was constructed. During the next fifty-five years, the following ministers pastored Anderson: Reverends J.C. Bell, Golden Price, S.L. Webb, W.J. Eubanks, N.W. Ross, R. D. Gerald, Whalon Blackmon, T. S. Davis, A.L. Holland, F.P Leonard, C.P. Payne, H.C. Clay, Sr., and John L. Baker. In September 1952, under the leadership of Rev. Blackmon, a new structure was built on Page Street and given the name Anderson Memorial. In 1968, under C. P. Payne, Anderson Memorial became Anderson United Methodist Church. In 1972, during the tenure of Rev. 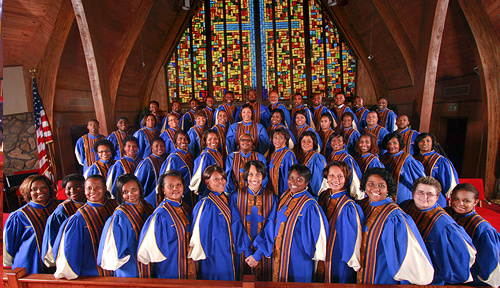 Clay, the white and black United Methodist conferences merged into one conference. In 1985, Rev. Jeffery A. Stallworth was appointed pastor at Anderson. It was under his leadership that the church moved to 485 West Northside Drive. Because of the tremendous growth, Anderson relocated to I-220 at Hanging Moss Road in November, 1994. At this time, membership was over 1,600. After being at this location for only two years, in December 1996 the membership at Anderson surpassed the 3,000 mark. In June 2002, the Rev. Joe W. May became Pastor of Anderson United Methodist Church. 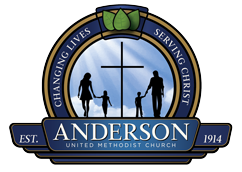 As membership continues to rise, Anderson United Methodist Church works diligently to provide a friendly worship atmosphere. Anderson is a body united in God’s grace. Our programs are designed to reach out to all mankind by serving, sharing, teaching, and witnessing through the giving of time, talents, and gifts. Anderson seeks to involve and utilize the talents of its entire membership as the church works to carry out God’s program. We appreciate your interest in Anderson United Methodist Church, as you may know, we have three Sunday services: 8:00am, 10:10am and 11:30am., and bible study on Wednesday night at 6:30pm. We pray that one of those services will fit into your busy schedule. The notion of “Making Room To Make Disciples” centralizes around Anderson’s vision and mission statement. This project is not just about the addition of rooms to a physical church, its about reaching out to the lost and helping them to find Christ, furthering His Kingdom for eternity. Some of you may be thinking, making room to make what? …To Make Disciples, but what is a disciple? A disciple is one who is continuing to trust in Jesus for the forgiveness of their sins and who desires to live in obedience to Him. We are commanded as brothers and sisters in Christ to go and make disciples. Some will respond because the Holy Spirit is pulling them and others will refuse because they want to live their own life. Please call the church at 601-982-3997 or email us at info@andersonumc.org if you need additional information. May God bless and keep you.